Some of the first considerations individuals research when purchasing a car are safety features. The main topic of this is generally air bag systems. Technology is advancing with great leaps today and air bags have not been left behind. The development of air bags systems is interesting. The early 70s saw the first air bags; however, these were for government use. It was not long before they were available in cars for purchase by the public as well. Then it was an expensive feature therefore not truly available to the common individual. Today all cars are equipped with some sort of air bags system due to road safety regulations. At one time there were only front air bags available, but now there are a number of styles installed into vehicles. These include the traditional front air bags; side torso; side curtain; and rear curtain air bags. There are also knee; seat cushion; seat belt; and center air bags. There are even motorcycle air bags available. This latter design is in either suit of jacket form. 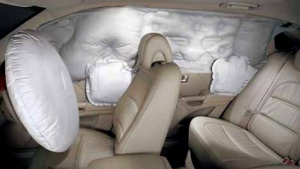 Vehicles sold within the United States must have front air bags as standard. This has been true since the regulation was introduced in the late 90s. The driver’s front air bag is stored within the steering wheel and the passenger’s is in the dashboard. New cars have weight sensors for air bags to ensure that it will not deploy in case the passenger is a small child. Many also have a type of impact sensor to dictate the force of deployment by the force of the impact. There are three main categories for side air bags which are torso, head, and a combination of these two. Torso side air bags are installed in the door or the side of the seat. Head side air bags are stored within the roof rail above side windows. There are two subcategories for this type which are known as tubular and curtain. Side air bags are designed to provide protection to those in the front passenger seat as well as those in the rear. This type can also aid in the prevention of passengers being ejected from the vehicle. Combination air bags are installed in the side of seats and are generally the largest of the three. The Toyota car company seems to have an obvious lead in the design of many types of air bags systems. 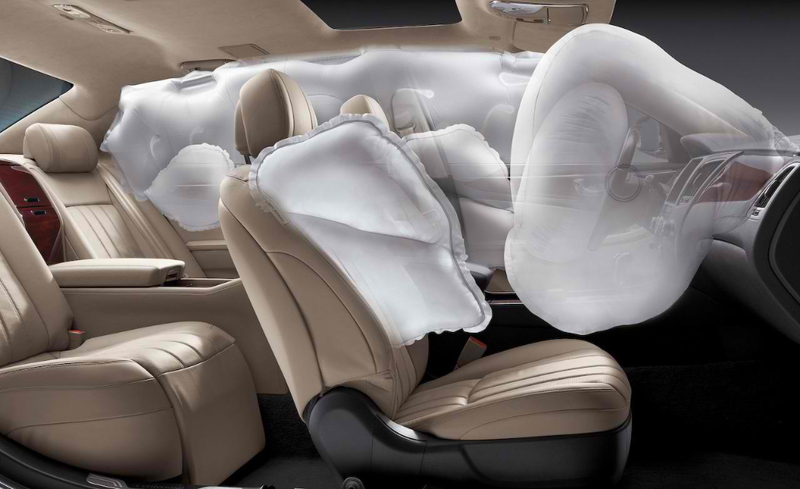 The company has introduced the rear curtain air bag which protects passengers in the backseat, if there is a collision to the rear end of the car. They were the first to develop rear seat center air bags which reduce injury to backseat passengers in the event of a side impact. The company also introduced the seat cushion air bag. This type is for both the driver and front passenger seat. It stabilizes and protects the pelvis during a front end collision. The knee air bag is situated below the steering wheel and/or the glove box. These were created to prevent several different types of injuries to legs. The seat belt air bag or inflatable seat belt is a relatively new concept. This style helps distribute the force of an impact reducing the risk of severe chest injuries. The action also causes the seat belt to tighten and reduces the risk of head injury by decreasing movement of the head.